There is nothing quite like slicing through the water in your aluminum boat. It remains a very popular type of boat in Minneapolis, MN due to the many virtues including Lightness, Strength and good Resale Value. This baby is built for long lasting fun. They are very durable and resistant to damage from sun, rot and weather, not to mention very fun to drive. Chances are you know someone who owns an aluminum boat that has been passed down through the generations. They are almost impervious to damages – Almost! If your aluminum boat has suffered damage or a leak you want to have it repaired by a shop with the Skills, Tools and Experience to ensure a durable and lasting repair. Technicians at Anchor Marine Repair are the boat repair experts for all of the major brands of aluminum boats seen on Minnesota lakes and rivers. Aluminum boats are actually quite complex systems that are not immune to problems like Rivet Leaks and Hull Dents after a day of playing hard and crashing into waves. Your boat is not just a big toy it is also a big investment. This is why it is of the utmost importance that you seek the help of boat repair experts should your prized aluminum boat sustain damages. Don’t risk voiding your warranty or taking on excess water by attempting to repair your own boat. Finding the source of a small leak in an aluminum boat can be challenging unless you are highly experienced in aluminum boat repairs. Anchor Marine Repair has made repairing and restoring boats our tireless mission. Our technicians have been fixing holes, dents and damages due to collisions and storms – in aluminum boats for a Combined 45 Years. We work on boats because it is our passion and pleasure. Customers come to us because we are trusted and affordable experts in the field of aluminum boat repairs and refurbishing. Anchor Marine Repair uses the latest techniques and technology to restore your beloved aluminum boat to looking the absolute best it can look. 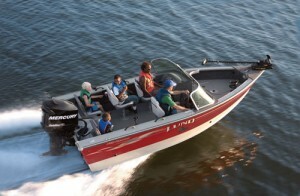 We are the Minneapolis, MN area Boat Repair Experts for all brands of aluminum boats. Bring us your Crestliner, Lund, Ranger, MasterCraft, Munson or Alumacraft boat and see for yourself what top quality workmanship can do to bring out the best in your prized aluminum boat. Copyright © 2010-2019 Anchor Marine Repair. All Rights Reserved.